It allows for both larger SBA loans and multiple SBA loans to the same applicant(s). The Green 504 loan is a second mortgage that can be as much as $5.5 million which makes transactions in the $12 to $20 million range possible...AND...loans are available on a "per project" basis. In other words, the "regular" SBA maximum eligibility limits of $5 million per borrower do not apply and larger businesses are able to utilize multiple 504 loans on multiple buildings. The usual SBA 504 jobs creation/jobs retention requirements do not apply making larger loans for businesses with fewer employees possible. This could be very useful for qualifying self storage businesses, hotels, parking garages and others with lots of square footage but few employees. It also provides financing for both small and mid size businesses to acquire, build or possibly refinance energy efficient buildings. The larger loan sizes are more suitable to larger businesses and the recently expanded maximum tangible net worth and income requirements of $15 million and $5 million respectively make it easier for larger businesses to qualify. If you need funding for a renewable energy project or renewable energy equipment financing then please visit our project financing page. The most common way to qualify for the Green 504 is to produce 10% of your own energy. Solar panels on your rooftop, property or carport/parking are the most obvious solution. Another way is to acquire or construct a building that uses 10% less energy than what you are currently using. It is important to remember that the 10% reduction is in energy consumption not dollars saved on lower utility bills. You can qualify if you lease or own a building now and finance another building that will consume 10% less energy than the building you currently own or lease. You can qualify if you lease a building now and you decide to purchase it and make improvements to it that cut your energy consumption by 10%. This could be as simple as a lighting retrofit using LED lighting since lighting typically accounts for 20 to 30% of a building's energy use. You can also qualify if you lease or own a building now and you build a new facility that is 10% more energy efficient. Again, lighting is a great way to accomplish this, but there are numerous other means as well including better insulation, modular construction using structurally insulated panels, a better HVAC system, energy efficient windows, etc.. Remember, the 10% reduction is calculated based on energy consumption not a reduction in energy bills, so efficiency is the goal, not just lower utility costs. Another way to qualify for the Green 504 is to acquire or build a new building that produces enough of it's own renewable energy to cut it's energy consumption based upon what it would have been without the improvements. If you do not own a building currently and have no baseline for energy consumption then SBA requires that you produce enough of your own energy to account for 10% of your total consumption since you do not have a existing building to benchmark against. You can produce the energy multiple ways using any of the common sources of renewable energy (solar, wind, geothermal, etc.) and the costs of installation can be included in the loan amount. You can also qualify if your business produces renewable energy or renewable fuels for others - or for sale to the local utility. This is easier for existing businesses and more difficult for startups as many lenders are still in recovery mode and prefer to lend to more traditional businesses. In some parts of the country some lenders are getting comfortable with financing solar farms, and it is certainly possible that a loan could be approved for a business that manufacturers a renewable product for sale to others. A good example would an expanding "waste to energy" business that needs a new facility. As mentioned above, one of the key benefits of the Green 504 is it removes the typical maximum $5 million SBA eligibility limit per borrower which typically prevents successful businesses from gaining access to more credit guaranteed by the government. Some lenders are still unwilling to lend to some businesses without a government guarantee of some type and the Green 504 opens up possibilities for many businesses in need of financing. As a result, a business can now acquire, build or possibly refinance multiple facilities using the new maximum amount of SBA financing of $5.5 million for each project. Keep in mind, $5.5 million is the amount of the second mortgage guaranteed by SBA which usually equates to 30 to 40% of the total financing and there is technically no limit on the amount of the first mortgage, so projects in the $10 to $20 million range are financeable. The SBA is now allowing the 504 program to be used for a refinance of owner occupied commercial property. Click here for more info the SBA refinance program. * For new construction, your business must initially occupy at least 60% of the commercial space. ** Net income is calculated after Federal income taxes (and excluding carry-over losses) for the 2 fiscal years prior to application. Manufacturers are defined as having fewer than 500 employees. The 504 loan has always been an outstanding program and the green aspect has made it even better. In fact, going green can also bring you new customers - according to a study by Javelin Research 43% of consumers said they are more likely to do business with companies they perceive to be green. The 504 loan from the Small Business Administration is for healthy businesses looking to build, purchase, remodel or refinance* and the "green 504 loan" or as we call it, The Green Choice Loan,™ now opens the program up to more businesses by allowing larger loan amounts. 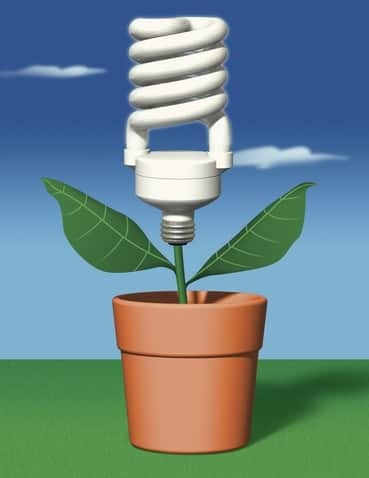 Your business can also take advantage of significant State and Federal Tax Deductions for making a building more eco-friendly and improving it's energy efficiency. This is good news for both small and mid-sized businesses who would like to do their part for the environment and save themselves some money in the process. Solar Power is the most common and abundant form of green power or renewable energy. It is also one that many businesses can utilize since many have roof space or available land for solar panel installation. If you are financing or refinancing an owner occupied building you might want to consider incorporating a solar power installation into the project using the 504 program. Manufacturing and (especially) warehousing businesses can benefit from solar power since they typically have a larger roof area than most other types of businesses. Businesses that produce alternative and renewable energy on site also qualify for maximum financing. Biofuel/Biodeisel or ethanol producers are good examples of businesses that could use the 504 for the purchase of energy producing equipment or expansion of their facilities. Going Green can save you a lot of money and drastically reduce your energy usage which is obviously great for the environment, and green building can also net you hefty tax savings as well. The federal government and many state and local utilities have tax incentive plans for the installation of green and renewable energy systems and some offer significant first year rebates which can help offset some of the renewable energy installation costs. The current Federal Tax Credit is 30% as of 2019. Obtaining a Green SBA loan to finance an energy efficient building for a healthy business or a well thought out and well capitalized new business is very possible, but finding a lender that is willing to finance renewable energy equipment like a large solar installation can be difficult, but there are other options. Technically, the 504 program is ideal for financing a Solar PV system, biofuel manufacturing equipment or other renewable energy equipment, but SBA loans are reliant on traditional lenders to provide financing and most of the traditional lenders are not interested in anything but commercial buildings. Renewable energy equipment financing is available and we have lending relationships that allow us to provide either a Long Term Loan or a LEASE to finance Solar installations (especially those making use of Feed-in Tariffs or PPA's). Please contact us at 1-800-414-5285 to see if your project is financeable. If you are developing a solar farm or some other type of renewable energy production facility it is possible that the Green 504 could work, but there are other types of financing through other more established solar pv financing programs or through other Federal programs. Please call us at 1-800-414-5285 for more info. If you have land or available roof space you may be able to significantly offset your energy costs and possibly sell energy back to your utility. Some states have substantial renewable energy incentives and in some states the renewable energy credits may produce enough cash flow to qualify for the loan. We also are able to assist with financing for large renewable energy projects should you require financing for a much larger project. Please click the following link for more info: renewable power production financing. Please contact us at 1-800-414-5285 to find out more about Renewable Energy and The Green Choice Loan™ and to see how our expertise with the 504 loan can help your business. *The SBA green refinance used to require a business "expansion," but that was temporarily changed by a bill aimed at helping Small Business - HR 5297 - which gave borrowers the ability to refinance using the 504. That program expired a few years ago and there is a new bill gaining traction that might allow a refinance without an expansion and that should pave the way for many businesses to do energy efficient retrofits of their buildings.